A WWII spy mission to pinpoint a double agent soon turns complicated, and the success of D-day hangs in the balance. Espionage is a novel of deception, betrayal, love, and redemption. Available in paperback, audiobook (narrated by Jason Tatom), and ebook. 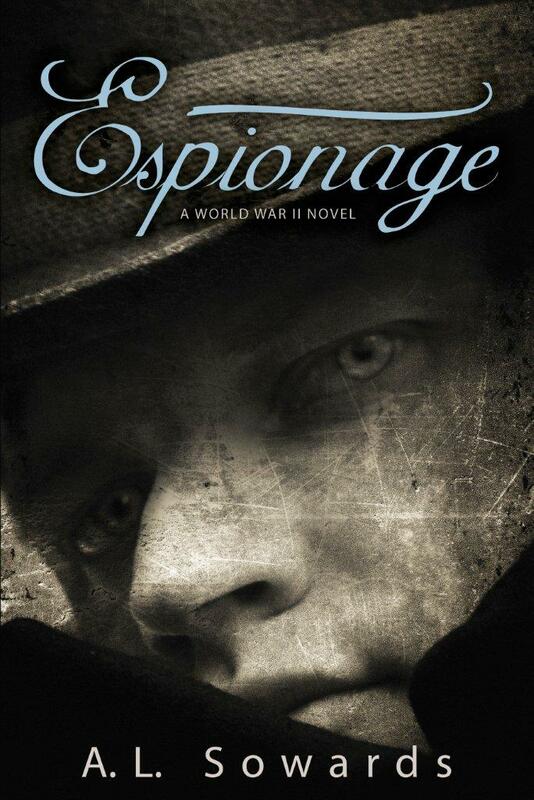 Espionage was a 2012 Whitney Finalist for best historical fiction. You can read part of the first chapter on Amazon and I’ve included questions for book clubs and a pronunciation guide here: Espionage Book Club Question, Espionage Pronunciation Guide. Here are links if you’d like an Authorgraph or want to add Espionage to your Goodreads shelf. Espionage is available at most LDS bookstores or can be purchased online at Amazon, Deseret Book, Seagull Book, or Barnes & Noble. I love the book, but you don’t have to take my word for it. You can read reviews on the purchase sites, Deseret News, Meridian Magazine, LDS Women’s Book Review, various blogs, or Goodreads. If you’ve read it and enjoyed it, please spread the word! Espionage is action-packed from page one and keeps this momentum throughout the entire book. Other elements like mystery, romance and suspense are woven throughout the book and add a layer of depth and credibility to the story. Another great aspect of the novel is the author’s attention to historic detail. Espionage is a great book that will entertain a wide audience of readers. This is a great story from many perspectives. Though it is clearly historical, it is more than that. There are some satisfying, non-preachy lessons on forgiveness, listening to the Spirit, and the universal potential for goodness or evil in all men. There’s a gradual awareness of the distinction between revenge and repentance. There’s heart-stopping danger and action. An exploration of different types of love weaves its way through the horror of war. Though this story is plot driven and action oriented, satisfactory character development occurs as well. Both Jacques and Peter mature and their characters grow in greater self-awareness, a higher understanding of God, more compassion for others, and confidence in their ability to accomplish the seemingly impossible. I can think of nothing negative to say about this book. I loved it! I was hooked from the first chapter and the story remained just as intense throughout. What an amazing book and even more impressive that this was Sowards debut novel. Love it! Published by Covenant, March 2012. Paperback ISBN: 978-1608611485; Kindle ASIN: B007EYBEIC; Audio ISBN: 978-1608611492. So they decided to stay with the man on the cover after all, eh? Very blue eyes. This website looks great! Hopefully you’ll have many more novels to blog about in the future! Congrats, sis. I guess they made some changes to the cover right before it went to press: no more blue eyes. This is so cool! I had no idea that you were a writer! I can’t wait to read it! Love the cover, can’t wait to read the book. Way to go!! Wow! I didn’t know your book was ready to go! Congratulations! Will you sign my copy when I get it? Thanks Lorita! And yes, I’d be happy to sign a copy for you! This is fabulous! I’m so excited for you! Congrats! I always knew you would write a great book. Sounds interesting. Can’t wait to read it. Love the cover…love the book summary…can’t wait to read the book…again! I know (because you told me) you’ve made many changes since I read it last so it will be like reading a new book, but with characters I’ve come to know and love already. I am so happy for you and so proud of you. You did it! Way to go after your dreams. I’m excited to read many more books to come. Thank you so much Teresa (for the post and for the wonderful test read a couple years ago). I can’t take credit for the cover or the summary–those are the work of my wonderful publishing house. I hope you’ll love the finished product! We are very excited to read it!! You are amazing! I am so excited to read your book! May there be many more. Thanks Linette! I’m also hoping there are many more to come! Very Exciting!! I love the look of the book…. now I can’t wait to get to read it!! WWII novels are the BEST!!! Congrats on such an awesome accomplishment! Oh la la!!! How very fun and exciting! So excited for you. You go girl! Hey Amanda! How are you? I miss you so much. I can’t wait to read your book, it looks so good. Love you! Thanks Vanessa! Love and miss you too, and hope you’ll like the book! This is a great website! Your personal photo is very cute, and I liked reading about your history of writing and about the history of this book. Looking forward to the book signing! Congratulations! I am SO excited to get this book! Since going to Europe and seeing many WWII sights, I have a whole new appreciation for history. Hopefully it will be here by February 21 and you can sign mine!! CONGRATS! Thanks Sherrilyn! I don’t think it will be out by the 21st, but I’m looking forward to hearing more about your trip! I ….can…..not….wait! This is absolutley GRAND! You are amazing Amanda and so will the book be. I’m excited to do a bit of name dropping. But most of all I’m excited to read this book! I’m remembering the nights you opted to read or write instead of other activities……looks like its payback time!!!! Congrats! I can’t wait to stand in line to get an autographed copy! Thanks Shelly! You are so sweet (always have been). I hope you’ll like the book. Exciting!! No, not that you have a book out (well that too) but the first chapter sample, I was hooked by the end of the second page!! I get so mad when I am watching a good show on TV and the words “To be continued” . . . come up. That’s just how I felt when the chapter was over and there was no more. Fantastic Amanda! I can’t wait to get the book and continue the adventure. It’s very well done, very interesting reading. Congratulations on your publication and release! Thanks Delrae! I’m so glad you like what you’ve read! I just read the chapter and it was great! Can’t wait for the book!! Glad you liked the first chapter–I think the rest of the book is even better! Thanks Stephanie. And thank you for your wonderful class at the Storymakers conference last year. The class and the Jack Bickman book you suggested were very helpful with revisions on this book! Hi gals… May I ask which Jack Bickman book you found helpful? Thank you! The one I picked up was The 38 Most Common Fiction Writing Mistakes, but Scene and Structure was also mentioned at that conference. Hey, thanks Heidi! Good luck with the Countdown to Summer contests! I hope you win some great prizes! And I’m guessing you’re a writer if you’re interested in Bickman’s books, so good luck with that too. Amanda, spent the last 24 reading frantically. You did a GREAT job! Thanks for the adventure! Thanks you, Shelly, for all your encouragement and for buying and reading my book! My copy has made its way to my bookshelves & has a place of honor near Jack Higgins & Alistair MacLean. You should feel proud about this for a few reasons, not the least of which is that only my favorite books make it near those authors’ works. I do feel honored to be by your Higgins & MacLean collections! Thanks MG! I just finished your book and I thought it was FANTASTIC! I went to Montana for the week, and knew I would be able to start the story there. It was midnight and I had about 60 more pages to go before I finished the book . . . I couldn’t put it down! I had to find out what happened to “Lt. Peter Eddy”! I kept reading until I finished, then thought about it all night long! Amanda, I am in awe of you! This is such an involved storyline, with great character depth. I absolutely LOVED it! Congratulations, I can hardly wait for “Part 2”! Thank you so much Sherrilyn! I’m so glad you liked it! Sorry for ruining your good night’s sleep. If I remember right, you usually do a lot of hard work in Montana and probaby needed your rest. First novel eh? You did an awesome job and I am so impressed-I would have never known! Thank you for giving us an exciting AND thought-provoking read. Thanks Carol. I did re-write it a few times, so maybe I should call it my first novel, version 20. Wow! This looks like a great novel. I love spy books! Thanks–I’m a fan of spy books too! You got me at the word “Calais”.In 1945, my father was in Marseilles but his brother was getting married in Calais and his new sister-in-law, I’ve been told, helped the resistance. The following is my father’s recorded memory of the events. I haven’t posted this yet, or the letters from my father, his brother and my grandfather, each telling the story from a different perspective. I’m thrilled that you are now following my blog and you’ll read the whole story when I get to that point in my letters. Thank you so much for posting that story, Judy. I guess after V-E Day the army wasn’t as strict about being late after leave? I’m excited to read more of your family’s letters on your blog. I think the “greatest generation” lived through an amazing time and have given us so many examples of courage, sacrifice, and goodness. I just finished reading Chapter 1 and can’t wait for the rest of the story. I really enjoyed the fact that each time Peter got through a crisis, he was almost immediately into another one. I think it’s going to be a great read. Oh, Amanda, I’m so behind the times! I read Espionage when it first came out and LOVED it! It was so exciting to read your words. I could hear your voice as I read. Wonderful! I didn’t know you had another book coming also. I am so excited to read this one as well. Just a couple more months! Amanda, just finished “Espionage”. Enjoyed it. I had a question about your research. I was wondering if you had read at all from the “Mammoth Book of Special Forces” edited by Jon E. Lewis? In this book there is a section about interrogation written by Bruce Marshall. The descriptions of your story sounded very familiar to those I had read from this book, so I wanted to ask. Thank you for stopping by my website. I’m glad you enjoyed “Espionage!” I haven’t read “The Mammoth Book of Special Forces,” but I looked it up on Amazon–the kindle edition is under $5, so I think I’ll add it to my (very-long) to-read list. Most of the water interrogation I read about in a book called “In the Shadows of War: An American Pilot’s Odyssey Through Occupied France and the Camps of Nazi Germany,” by Thomas Childers. In addition to the American pilot, the book also followed several people working with the French Resistance, and some of them didn’t survive the war. Other aspects I picked up from multiple books (I have a list, if you’re interested, but I read or skimmed the books years ago, so I honestly don’t remember which books talked about which interrogation techniques). I hope that if the scenes felt accurate to you, it means I did a decent job on the research! Sean, I recently read the Bruce Marshall chapter in the “Mammoth Book of Special Forces.” I am so impressed with Yeo-Thomas–what an amazing man! I read a little about him in a book called “Between Silk and Cyanide” last November/December and wanted to know the full story, so I also picked up “The White Rabbit,” by Bruce Marshall. If you like nonfiction, “The White Rabbit” is a good one. It includes Yeo-Thomas’s interrogation and torture, but also his work in France before his capture and his survival in several prisons and concentration camps after the Gestapo was finished with him.